First of all you might want to know what is ASCII ? It is the acronym of American Standard Code for Information Interchange. Well, it is simply a code which shows the English characters as numbers. That’s how the computers in the tech world contact with each other when we transfer data. Like, O is referred to as 79, M as 77 and so on. Normally, ASCII is famous to people through its art. Everything is drawn with letters, numbers and symbols. It certainly looks attractive and sometimes seems impossible to remake it. Well, nothing is impossible but it sure does take a lot of time to complete it ! 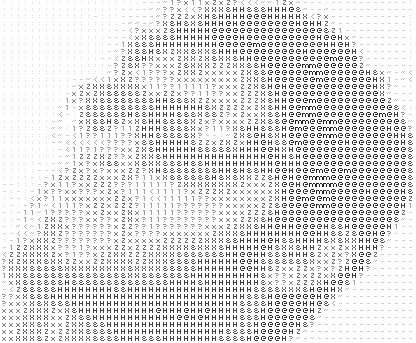 There is a particular site where you can have your face drawn in ASCII format. It’s very simple ! What you have to do is nothing but upload the photo file and then the rest is done by the app itself ! This is a pretty interesting app which I wanted to share with you all ! Below is a picture of mine which shows how your pic would look in ASCII format! Remember to crop your picture to 60 X 50 pixels ! Get your photo done in ASCII format ! Enjoy! Thanks dude! I like it. Great post. Thanks for you sharing this information. Nice, this looks like a lot of fun 🙂 should try it! Looking like Che Guevara here !